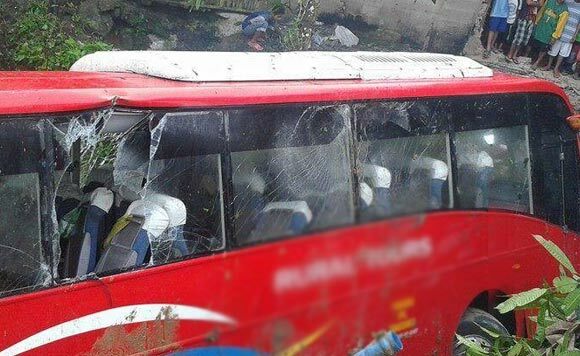 A bus fell off the creek in Barangay Kawit Oriental, Kauswagan, Lanao del Norte on Tuesday afternoon after the driver lost control of the vehicle, injuring most passengers. Senior Insp. Jake Peralta, chief of the Kauswagan municipal police, said 25 of about 30 passengers suffered minor injuries, including the driver Pedelino Morales, 36, were brought to a nearby hospital in Kauswagan town. Police report showed that the Rural Transit Mindanao bus was travelling to the Lanao del Norte area from Iligan City when the incident happened. “Mabilis daw ang takbo sabi ng mga nakasaksi at kurbada ang area kaya dumeretso sa may creek (Witnesses said the driver was driving very fast and that area is curved so it went straight to the creek),” Peralta said.